Protester Michelle Brown (left) demonstrates outside a Center City Starbucks on April 15, 2018, in Philadelphia. Updated Wednesday, May 2, 2018, 3:10 p.m. EDT: Starbucks says it has settled for a yet undisclosed amount with Donte Robinson and Rashon Nelson, two black men who were arrested in a Philadelphia Starbucks after a manager called the cops on them. The crime? Waiting around for their friend. “After constructive conversations, Donte Robinson, Rashon Nelson and Kevin Johnson, CEO of Starbucks Coffee Company, reached an agreement earlier this week,” read a Starbucks press release the company posted Wednesday afternoon. The Associated Press reports that Starbucks will fund the rest of their undergraduate education through Starbucks’ partnership with Arizona State University. Johnson thanked the two men for their “willingness to reconcile.” The agreement reached between the two men and the Starbucks company includes a financial settlement, as well as “continued listening and dialogue between the parties and specific action and opportunity,” according to Starbucks’ statement. The company said that more details will be available once Robinson, Nelson and the company agree to a public statement. More details have also emerged about Robinson and Nelson’s settlement with the city of Philadelphia, in which they were awarded a symbolic $1 each. As part of their settlement, the city also promised to start up a $200,000 entrepreneurship program for Philadelphia public high school students. In addition, Robinson’s and Nelson’s arrests will be expunged from their records. The two black men arrested at a Philadelphia Starbucks while they were simply waiting on a friend to arrive have settled with the city, the Associated Press reports. The pair were awarded $1 and a pledge from the city of Philadelphia that it would set up a $200,000 program for young entrepreneurs. For perspective, the mayor’s proposed city budget for 2019 is $4.69 billion. Of that amount, $709 million will go to policing and $256 million to prisons. The high-profile arrest occurred last month as Rashon Nelson and Donte Robinson, both real estate agents, waited for a friend to join them to go over a potential deal at the popular coffee chain. A Starbucks store manager called police, presumably because the men hadn’t purchased anything yet. Customers who witnessed the arrest questioned the police as they came to cuff the men, protesting that the men hadn’t done anything and hadn’t been waiting long. The incident sparked protests around the country and passionate conversations about the dangers for black people in white spaces, as well as the dangers of escalating innocuous incidents with a police presence. Starbucks CEO Kevin Johnson called the arrest “reprehensible” and mandated implicit bias training, which will occur at Starbucks locations nationwide later this month. 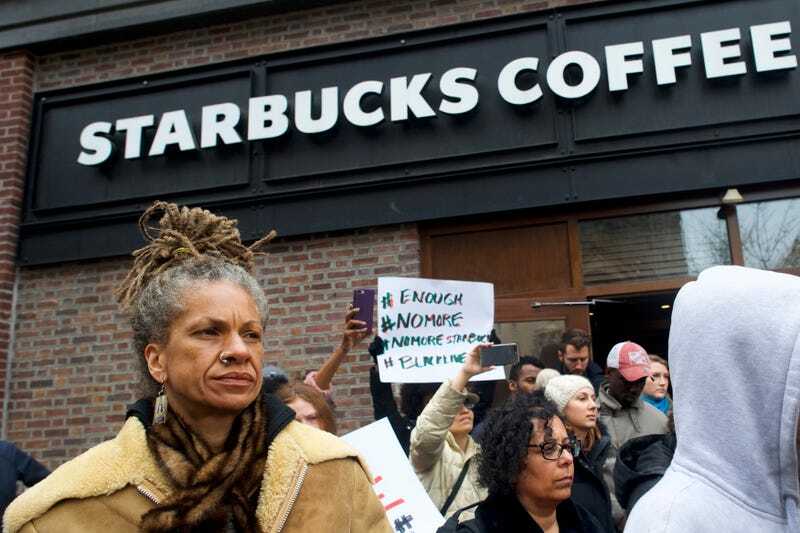 There is no indication that Nelson or Robinson intends to sue Starbucks.